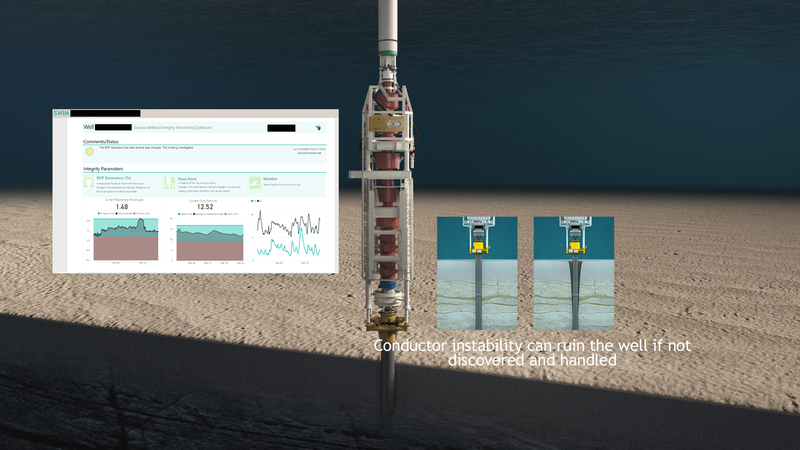 Together with Lundin Norway, 4Subsea has developed a case study explaining how a digital twin can be used to ensure that drilling campaigns continue in spite of concerns over soil support and conductor instability. The use case explains how a digital twin works in such a context, and how the combination of machine learning, advanced algorithms and domain expertise provide decision support to the operations team onshore and offshore – resulting in significant cost savings. In the spring of 2018 Lundin Norway experienced escalating conductor instability while drilling on one of their exploration wells. The instability was caused by wash-out, resulting from vessel and wave induced motions on the BOP and by challenging soil conditions. Lundin Norway used an ROV to visually observe the movements of the BOP. By using the well specific digital twin SWIM™ to update conditions, evaluate the consequence and verify wellhead integrity throughout the remains of the operation after soil stability issues, the operation did not have to be aborted. The drilling campaign continued, with the benefit of significant cost savings. In 4Subsea we believe new insights arise when engineers are empowered with the right data at the right time, and in the right manner. This case is an example of how digital technology and advanced data analysis empowered engineers in Lundin Norway and 4Subsea to collaboratively take operational decisions and avoid the abortion of an ongoing drilling operation.